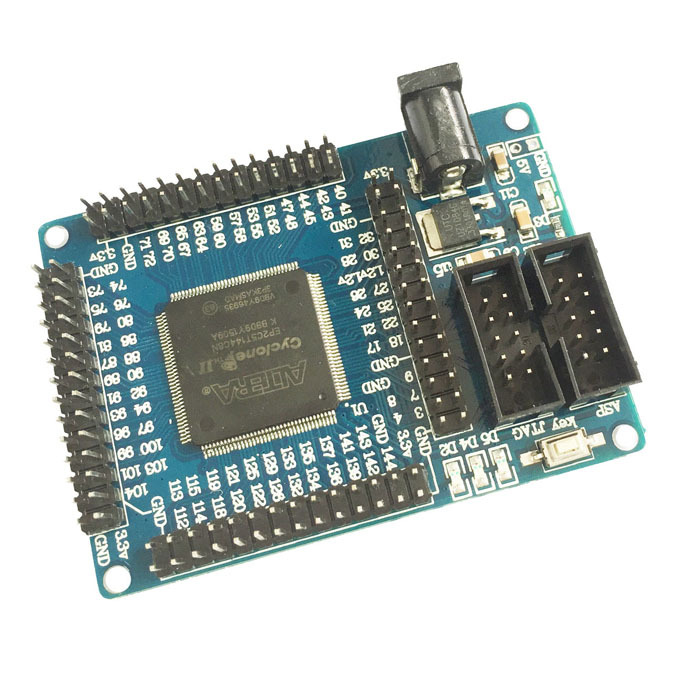 There are a good number of cheap, small fpgas available around on ebay now, but lack sufficient documentation on how to set up the tool chain and get programming. This guide hopes to give a quick way into the world of fpgas. Windows only I'm afraid! Good luck trying to get drivers and the software to work in wine. There are a wide range of suppliers that you can get the board I will be documenting. I managed to get my EP2C5T144 altera minimum system learning development board from here. Make sure you get a USB blaster as well! The board has two interfaces in which to program it - the JTAG and ASP ports. Luckily, the USB blaster is capable of both protocols and we will be using them both! After installing (it can take quite a while), if you plug in your USB blaster, it will most likely not be able to find the device driver. Quartus II comes with the drivers, but they are not signed so windows will not allow them to be installed! There are a few places where people claim to have signed the drivers themselves if you want the easy route, but the (somewhat) safer route is to disable driver signing and install the official altera drivers. Run the first as an administrator to disable driver signing and reboot. Now, plug in the usb blaster and open up device manager. Find the device and manually find driver software. Assuming you installed Altera Quartus to the default location, set windows to find the drivers in C:\altera\. Now we can assign the pins, Assignments -> Pin Planner. At the bottom, select the locations of the inputs and outputs. You can see the pins I went with (which are already connected to the onboard LEDs, switch and clock) in the picture below. You can then close that window. It is suggested to set the unused pins to be tri-stated (effectively disconnected). To do this Assignments -> Device, then click "Device and Pin Options", select "Unused Pins" and set them to "As input tri-stated with weak pull-up"
Now double click on "Program Device (Open Programmer)"
Close that window and then click Auto Detect, nothing should really change but the bottom half of the screen should still show the EP2C5T144 in the JTAG chain. The program should now be on the fpga! HOWEVER this code will not run accross power cycles, for this we need to program the onboard EEPROM chip! Click "Device and Pin Options"
Change Mode from JTAG to "Active Serial Programming"
The bottom pane now reflects the chip we are programming, make sure to select "Program/Configure" and optionally "Verify"
For more info on integrating and using ModelSim, you can use this guide https://www.altera.com/en_US/pdfs/literature/ug/ug_gs_msa_qii.pdf, however some parts seem to not work entirely and I should really write a quick-start guide on that as well.